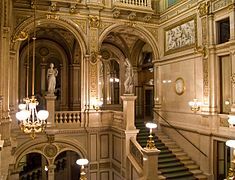 The Vienna State Opera (German : Wiener Staatsoper) is an Austrian opera house and opera company based in Vienna, Austria. It was originally called the Vienna Court Opera (Wiener Hofoper). In 1920, with the replacement of the Habsburg Monarchy by the First Austrian Republic, it was renamed the Vienna State Opera. The members of the Vienna Philharmonic are recruited from its orchestra. August Sicard von Sicardsburg was an Austrian architect. He is best remembered as the co-architect of the Vienna State Opera, together with Eduard van der Nüll. Eduard van der Nüll was an Austrian architect, who was one of the great masters in the historicist style of Vienna's Ringstrasse. Wöllersdorf-Steinabrückl is a municipality in the district of Wiener Neustadt-Land in the Austrian state of Lower Austria. Kelheim is a town and municipality in Bavaria, Germany. It is the capital of the district Kelheim and is situated at the confluence of Altmühl and Danube. Kelheim has a population of around 15,750. Breitenbrunn am Neusiedler See is a small wine village in the district of Eisenstadt-Umgebung in the Austrian state of Burgenland. Dimension stone is natural stone or rock that has been selected and finished to specific sizes or shapes. Color, texture and pattern, and surface finish of the stone are also normal requirements. Another important selection criterion is durability: the time measure of the ability of dimension stone to endure and to maintain its essential and distinctive characteristics of strength, resistance to decay, and appearance. Sóskút is a village in Pest County, Hungary. The building was, however, not very popular with the public. On the one hand, it did not seem as grand as the Heinrichshof, a private residence which was destroyed in World War II (and replaced in 1955 by the Opernringhof). Moreover, because the level of Ringstraße was raised by a metre in front of the opera house after its construction had begun, the latter was likened to "a sunken treasure chest" and, in analogy to the military disaster of 1866 (the Battle of Königgrätz), was deprecatingly referred to as "the 'Königgrätz' of architecture". Eduard van der Nüll committed suicide, and barely ten weeks later Sicardsburg died from tuberculosis so neither architect saw the completion of the building. The opening premiere was Don Giovanni , by Mozart, on May 25, 1869. Emperor Franz Josef and Empress Elisabeth (Sissi) were present. Moritz von Schwind was an Austrian painter, born in Vienna. Schwind's genius was lyrical—he drew inspiration from chivalry, folklore, and the songs of the people. Schwind died in Pöcking in Bavaria, and was buried in the Alter Südfriedhof in Munich. The Theater an der Wien is a historic theatre in Vienna located on the Left Wienzeile in the Mariahilf district. 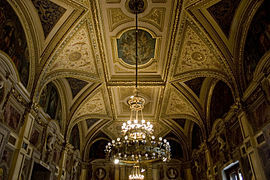 Completed in 1801, the theatre has hosted the premieres of many celebrated works of theatre, opera, and symphonic music. 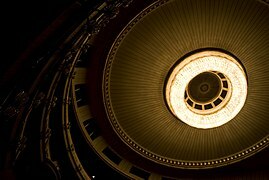 Since 2006, it has served primarily as an opera house, hosting its own company. However, in 1949, there was only a temporary roof on the Staatsoper, as construction work continued. It was not until November 5, 1955, after the Austrian State Treaty, that the Staatsoper could be reopened with a performance of Beethoven's Fidelio , conducted by Karl Böhm. The American Secretary of State, John Foster Dulles, was present. The state broadcaster ORF used the occasion to make its first live broadcast, at a time when there were only c. 800 televiewers in the whole of Austria. The new auditorium had a reduced capacity of about 2,276, including 567 standing room places. The ensemble, which had remained unified until the opening, crumbled in the following years, and slowly an international ensemble formed. The Wiener Staatsoper is one of the busiest opera houses in the world producing 50 to 60 operas in a repertory system per year and ten ballet productions in more than 350 performances. It is quite common to find a different opera being produced each day of a week. The Staatsoper employs over 1000 people. As of 2008, the annual operating budget of the Staatsoper was 100 million euros with slightly more than 50% as a state subsidy. 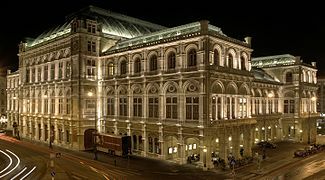 The Vienna State Opera is particularly open to children: under Holender's direction (he has three children of his own), the opera house has become well known for its children's productions, which are performed in a tent on the roof of the Staatsoper. Recent examples include Peter Pan , Das Traumfresserchen [ de ] (The Dream Gobbler), Der 35. Mai (The 35th of May), C. F. E. Horneman's Aladdin, Bastien und Bastienne and Wagners Nibelungenring für Kinder (Wagner's Ring for children). In addition to this, there is a production of The Magic Flute every year for 9- and 10-year-olds, decorated like the Opernball. Every performance at the Vienna State Opera is reviewed by an independent company in the opera publication Der Neue Merker  (The New Judge) which is printed in about 2000 copies. This is unusual in that most opera magazines prefer to concentrate on new productions and premieres. There is an online version  parallel to the publication, which receives (as of March 2007) an average of 10000 visitors a week, and therefore is one of the most successful German-language opera portals. Emanuel Schikaneder, born Johann Joseph Schickeneder, was a German impresario, dramatist, actor, singer, and composer. He wrote the libretto of Wolfgang Amadeus Mozart's opera The Magic Flute and was the builder of the Theater an der Wien. Peter Branscombe called him "one of the most talented theatre men of his era". Josef Alois Krips was an Austrian conductor and violinist. Franz Salmhofer was an Austrian composer, clarinetist and conductor. He studied the clarinet, composition and musicology in Vienna. Salmhofer served successively as Kapellmeister of the Burgtheater, Director of the Vienna State Opera and Director of the Vienna Volksoper and composed a number of works, few of which are played today. Waldemar Kmentt was an Austrian operatic tenor, who was particularly associated with the German repertory, both opera and operetta. Adrian Eröd is an Austrian operatic baritone. He is the son of composer Iván Erőd. Esther Réthy was a Hungarian operatic soprano who had a major career in Europe from 1934 through 1968. She was notably a principal artist at the Vienna State Opera for over a decade and was a frequent performer at the Salzburg Festival. She performed a broad opera repertoire that encompassed French, German, Italian, Czech, and Hungarian operas. The latter part of her career was dedicated mainly to performing the German operetta literature at the Vienna Volksoper. A very beautiful woman, she was a greatly admired Angele in Richard Heuberger’s Der Opernball. Henry Maria Krips, MBE was an Austrian-Australian conductor and composer, best known for his 23-year record term (1949–72) as principal conductor of the South Australian Symphony Orchestra. 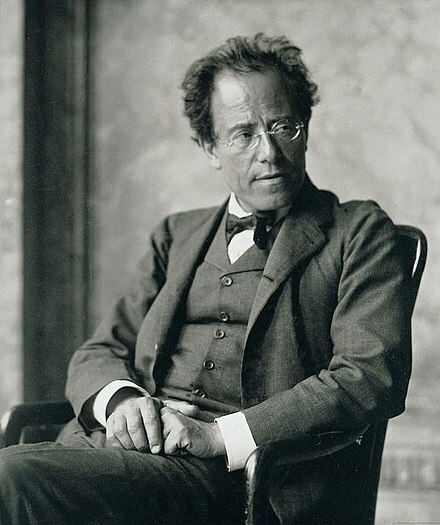 He is credited with introducing the works of Gustav Mahler to Australian audiences. Vienna State Ballet, Wiener Staatsballett, is considered one of the world's top ballet companies. It was formerly named the Vienna State Opera Ballet as it is based at the Vienna State Opera building. In 2005 the ballets of the Vienna State Opera and the Vienna Volksoper were merged under the name Das Ballett der Wiener Staatsoper und Volksoper and Gyula Harangozo became the artistic director. The further name change, on September 1, 2010, was accompanied by a change in leadership. Manuel Legris, a former principal dancer with the Paris Opera Ballet, succeeded as the artistic director. Josef Löwy was an Austrian painter, publisher, industrialist and Imperial and Royal court photographer. Viktor Madin, originally Viktor Madincea, was an Austrian opera singer (baritone) of Hungarian descent. He was a member of the ensemble of the Vienna State Opera for more than fifty years. Oskar Czerwenka was an Austrian operatic bass and academic teacher. He was a member of the Vienna State Opera from 1951 to 1986, performing 75 roles, including his signature role Ochs auf Lerchenau and premieres of new operas. He was also an author, visual artist and illustrator, and performed in concert. He received several awards, and the state music school in his home town was named after him. Marco Arturo Marelli is a Swiss set designer and stage director who has worked at European opera houses for opera and ballet. He designed sets for ballets by John Neumeier, and for premieres of the operas Thomas Chatterton by Matthias Pintscher at the Semperoper in Dresden (1998) and Medea by Aribert Reimann at the Vienna State Opera (2010). Anny Felbermayer was an Austrian soprano in opera and concert. The lyric soprano was a long-term member of the Vienna State Opera. She appeared in many operas by Richard Strauss, including the premiere of his Die Liebe der Danae at the Salzburg Festival in 1952. Herbert Lippert is an Austrian operatic tenor. Josef von Manowarda was an Austrian operatic singer. Ferry Gruber was an Austrian-German tenor in opera and operetta. A member of both the Bavarian State Opera and Staatstheater am Gärtnerplatz in Munich for half a century, he focused on roles of the buffo genre and operetta. He made recordings, appeared on radio and television, performed internationally at major opera houses and festivals, and worked also as an operetta director and a private voice teacher. He was a favourite with the audience, and received the title Kammersänger. 1 2 "Seating plan and admission prices" (in German). Vienna State Opera. Retrieved 2013-07-17. ↑ von Hornau, Phillipp (2012). Wien ist anders – Ist Wien anders? (in German). p. 631. ↑ Kaspar Mühlemann Hartl, museum in progress; Dominique Meyer, Vienna State Opera (Ed. ): CURTAIN – VORHANG. A Living Museum Space – The Vienna State Opera Safety Curtain, Vienna: Verlag für moderne Kunst 2017. ISBN 978-3-903228-11-5. ↑ Michael Cooper (2016-12-21). "Sony Executive to Lead Vienna Opera". New York Times. Retrieved 2017-07-31. ↑ "Philippe Jordan ab 2020 Musikdirektor der Wiener Staatsoper" (Press release). Vienna State Opera. 31 July 2017. Retrieved 2017-07-31. ↑ Michael Cooper (2017-07-31). "Philippe Jordan Will Lead the Vienna State Opera. Can He Bring Peace?". New York Times. Retrieved 2017-07-31. Wikimedia Commons has media related to Vienna State Opera .